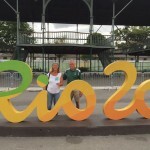 CSU Swimming & Diving » An Amazing Difference Maker! The Holiday season is upon us and my heart bursts (no pun intended) with pride as I experienced the impact of the Heritage Project on CSU Athletics. 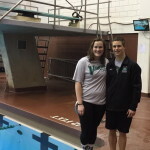 My experience during late November when I attended the Magnus Cup Swimming and Diving Invitational and the Horizon League Championship game of Women’s Volleyball was phenomenal and something I wish to share with you. 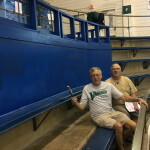 The Robert F. Busbey Natatorium has never looked better. As I looked down upon our world class aquatic facility from the spectator area above the new graphics visible in all directions , the Video Interactive Kiosk, the state of the art Score Board, the beautiful blue water and the history of our program were evident everywhere. 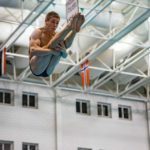 The Wow Effect was in full bloom as spectators, coaches, swimmers and divers all remarked how exhilarating the appearance of the pool impacted us all. 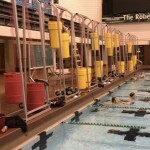 I had the opportunity to swim between sessions and what amazed me most was how you could see all the graphic displays in the water and the motivational impact that was felt. I literally glided through the water with a feeling of joy. It is an amazing feeling knowing how much time, effort and expertise came together to meet the many goals of the Heritage Committee. Between sessions I also attended my first Horizon League Championship Event in Woodling Gymnasium. The CSU Viking Women’s Volleyball Team dominated Valparaiso University to win the crown! Pride, Enthusiasm, Discipline, Athleticism and Focus were evident in the winning performance. I am impressed with Coach Chuck Voss and his staff with the high level of performance obtained by their Team. 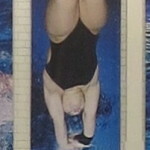 The CSU Swimming and Diving Team had Championship performances in breaking four pool and school records and winning many events. 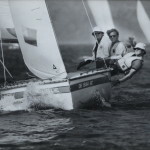 The Men won the Magnus Cup and both teams showed great improvement. I was Viking Proud! Coach Graham and his staff are to be commended. 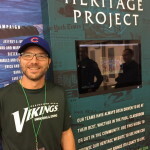 The Heritage Project is about Connecting, Recruiting, and providing support for the program we love. The support can be displayed not only in monetary donations but providing resources to help all those who are and have been in the program through career development and the many other critically important factors needed to make a bright future available. 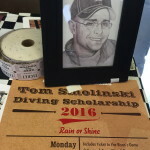 Our next focus is promoting the Tom Smolinski Endowment for Diving on CSU Giving Day on Wednesday February 24, 2016. On that day you will be able to give as little at $5 (more if you like !) with just a click of the mouse or touch of the finger! 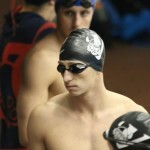 Tom, a former two times Conference Champion Diver (98/99), recently tragically died in an automotive accident. His wife Kim along with her two young daughters has raised over $25,000 dollars. The Busbey Foundation has made a commitment to match all gifts given up to $5K. We plan to donate this match on Giving Day. 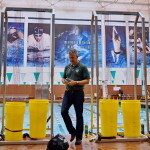 More than just raising funds for Tom’s endowment we would like to also see Swimming and Diving alumni the most involved giving CSU alumni in terms of the number of Giving Day donations. With hundreds of alumni we CAN demonstrate our TEAM IS FOREVER attitude. As we approach the Giving Day Date we will continue to remind all to get involved at whatever level you can afford. The most important factor is that you CARE! 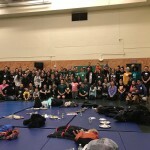 Help us help reach other alumni. And most important on Giving Day “Just push the button” ! Carol and I wish everyone the happiest of holidays! May you truly be touched by the love and joy that surround us! Vikings Forever! It’s so wonderful to know that all those students mentioned in this article are so active in the swimming and diving activity. It’s not only healthful but is a fine way to demonstrate your devotion that is making you a first class citizen for the future. Keep up the good work.